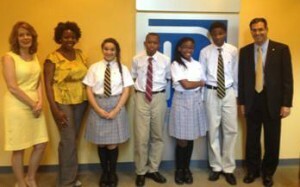 From left, Beneficial Bank Vice President of Lending Operations Merle Brown; Cristo Rey Admissions Coordinator Unique Saunders; Cristo Rey students Yohalis L., Mark H., Kelliann A. and David J.; and Beneficial Bank Vice President of Community Development Robert Juliano. Four students from the new Cristo Rey Philadelphia High School didn’t just start another school year Sept. 4 – they also began working at the Center City headquarters of Beneficial Bank. The four freshmen — Yohalis L., Kelliann A., Mark H. and David J. — are learning about accounting, lending and compliance, among other areas, and are gaining real-life job skills in the process. Cristo Rey Philadelphia is a new independent college preparatory Catholic school for low-income students that helps build skills to succeed in college and the modern workplace. Based on a successful model used in 24 cities across the U.S., teams of four students work five days per month in partnering corporations, which provide them with invaluable work experience and subsidize approximately 60 percent of the cost of their education. Beneficial Bank is a job partner for the school’s inaugural year, along with 19 other area corporations. The Beneficial Foundation contributed $30,000 for Cristo Rey to establish its innovative program in Philadelphia.